The only publication of its kind, Energy & Metals Consensus Forecasts™ is the result of a comprehensive monthly survey of over 40 of the world’s most prominent commodity forecasters covering over 30 individual commodity price forecasts including coal. The publication has many practical uses including commodity investment analysis, risk management, corporate planning, and budgeting. A free sample issue is available by clicking on the box below. 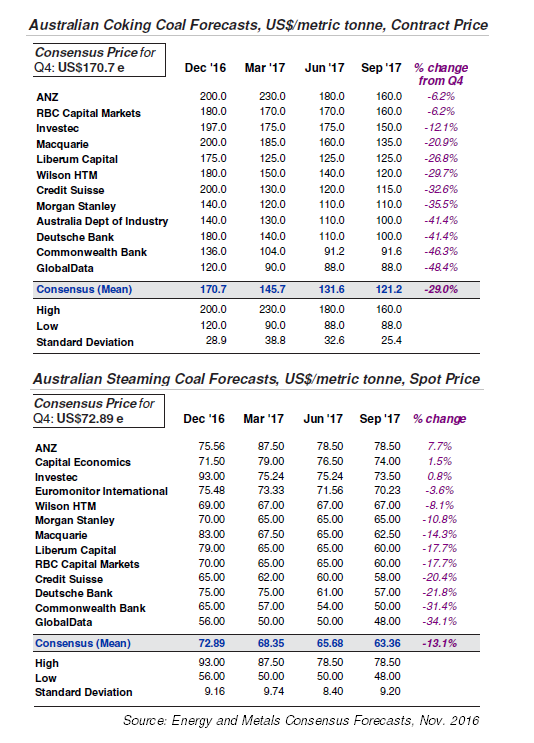 The coal price forecasts in the table below from our November 2016 survey are based on Australian-Japanese contract prices for Australian hard coking coal and Australian steaming coal. The full table contains forecasts for the next 8 quarters, as well as the long-term outlook through the upcoming 10-year period. A recent sample issue of the publication, which also includes Consensus Forecasts™ for Crude Oil, Gasoline & Heating Oil, Natural Gas and Uranium, as well as base, ferrous and precious metals, can be downloaded in PDF format by clicking the link below.